"In The Name Of The Rebellion"
After a pretty all around great premiere, Star Wars Rebels unfortunately falls back into its bad habits: big but underwhelming cameos, unnecessary references and Easter Eggs, and, most specifically, a basic, textbook sense of plotting that never goes beyond the rote narrative. There are definitely heavy themes here–the complexity of war, the questions of how far the rebels will go to win it, and if there are lines that can or can’t be crossed in the name of the rebellion, but “In The Name of The Rebellion” (see what I did there?) falls apart pretty much the same way every time Star Wars Rebels tries to play the “at what cost?” game. Sure, there are the requisite characters voicing the issues, the conflicts, the dilemmas, the stakes. But the actual story that’s told–the two stories that are told, to be exact–barely reflect those themes. Characters never are truly faced with the hard questions or choices, and it just doesn’t lead to any real consequences for our main characters or the rebellion overall. Apparently, a lot of time has past after the events of “Zero Hour” and, I guess, “Heroes of Mandalore.” When Kanan, Ezra, Sabine, and Chopper arrive on Yavin-IV –you know, that famous rebel base that’s in basically most of the Star Wars franchise, Zeb greets them like they’ve been gone for months. Same with Hera, who, after crash landing from a failed supply run, embraces Kanan like low-key pining lovers that haven’t seen each other for months–or for four seasons (okay, that was a joke). It’s an odd beat to play though, I think, especially since that sensibility doesn’t really last long enough to register. It’s just weird, which comes off as a light, positive distraction to the darker stuff to come: the Hard Choices and How Far Should The Rebellion Go To Win This War talk. And, to be clear, it is talk. It is talk between Mon Monthma and Ezra Bridger. It is talk between Mon Mothma and Saw Gerrera. It is talk between Ezra Bridger and Kanan Jerrus. It is talk between Ezra Bridger and Hera Syndulla. It is talk between Hera Syndulla and Kanan Jarrus. I do not doubt the veracity, the honesty, and the depths of these discussions. The war between the Empire and the rebellion has been long and complicated, and loyalties, morals, ethics, and procedures are, and should, be questioned all day long. The Mon Mothma/Saw Gerrera talk is the most heated and passionate, the one in which two leaders don’t mince words and are blunt in their criticisms of each other. But talking makes for weak entertainment–show don’t tell, etc. All that talk should be the thematic backbone to the current mission, in which the Ghost crew has to sneak onto a major relay satellite and install a repeater spike so they monitor transmission, instead of blowing it up. But it’s just… not. Instead, it’s a pretty generic (if visually entertaining) adventure, a mission that goes wrong, and in which characters have to adjust on the fly, as per usual, and none of the characters have to make a single tough choice. There is a moment in which, arguably, a crucial decision has to be made: after Ezra and Sabine are caught, they go from monitoring the satellite into deciding to blow it up - a point that was specifically discouraged by their superiors. And while we get a funny but action-packed episode of the constantly-adjusting satellite dish and Force-guided aerial chases, that question–that decision–never really comes into play. After all that talk, neither Ezra, Sabine, Kanan, Zeb, Hera, or Chopper have to scrounge up the fortitude to make a tough choice, since at the last minute, Saw Gerrera swoops in and makes that convenient hard choice for everyone, while also saving Ezra and Sabine. He blows up the satellite, no real fuss or fallout, then takes Ezra and Sabine off with him, only because it wasn’t safe to give them back to Hera and Kanan. There’s a lot to like about Gary Whitta’s script, who parses out his action quite smoothly and throws in a few charms with his pairings: Sabine and Ezra, and Kanan and Hera, at their core, play well off each other. But beyond that, there’s really nothing. The final moments of the first part do suggest a “re-parenting” of sorts. After all the various talks and conflicts, there’s this idea that Ezra and Sabine will be given a different set of lessons from a parental figure outside of the calmer, measured, controlled mindsets of Kanan, Hera, and Mon. Saw certainly isn’t parent material, but there’s a suggestion that maybe his ideas will have some influence on the impressionable minds of Ezra and Sabine (more Ezra than Sabine, but still). But that’s not what happens. 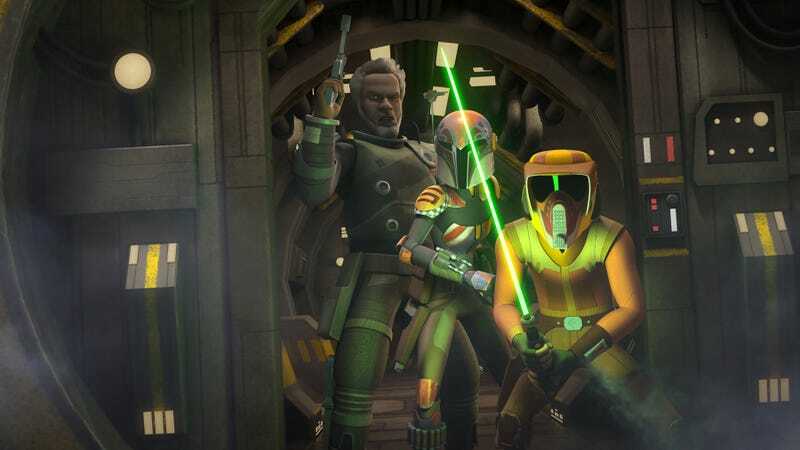 Instead, Saw, Ezra, and Sabine investigate some evidence that Saw followed up on from “Ghosts of Geonosis,” leading to a civilian cargo facility that, strangely, houses a number of Imperial troops. At first, Sabine and Ezra were cautiously curious about Saw’s mission, but soon they’re on board (his evidence checks out), and everyone is trying to figure out what the Empire is really hiding. The episode ends on the vague idea that the Empire is maybe building something deadly, and the overall discomfort that the Empire is readily ahead of a rebellion that many people aren’t even aware exists. It’s a quiet, low-key down note to end on, but it would have hit harder if “In The Name Of The Rebellion” narrowed in on a plot that backed all this up. Maybe this episode was the start of something that will grow deeper? We’ll see, but this isn’t a particularly auspicious start. Disney XD has been insane with scheduling. This was supposed to have repeat airings throughout the day starting at 12:30AM, but the network abandoned that strategy at the last minute, which is why this review is posted so late on Monday. Part one was written by Gary Whitta and directed by Sergio Paez. Part two was written by Matt Michnovetz and directed by Bosco Ng. Ezra is so bad in the first part, and it has been frustrating to watch his bad choices get, if not rewarded per se, weirdly dismissed. Trying to impersonate Commander Brom Titus on the Star Destroyer was infinitely a bad move. Like, it wasn’t even remotely logical or clever, and it pretty much was the reason they got caught. (I know that was an attempt at a humorous moment, but it’s too dumb to be funny.) This show never could get a handle on Ezra, and it’s probably the most frustrating part of the show. On rewatch, I just realized that Ezra nor Sabine don’t use their jet packs after they get caught while on that dish, so they wouldn’t have to have been so awkward running around ? They do use them when they fly up onto Saw’s ship though. Plus Sabine doesn’t fire back at the Stormtroopers. A lot of details don’t quite connect during that first part, but it’s at least fun. Was anyone else confused by how the second part paced itself? Characters would mention certain rooms as important but then go exploring other rooms. Something about how that was handled seemed wonky to me. I suppose this season will ultimately reveal whatever weapon the Empire was building that both needed a Kyber crystal and a near-genocide of an entire race. It’s probably the Death Star, which, yawn. That’s it for now! 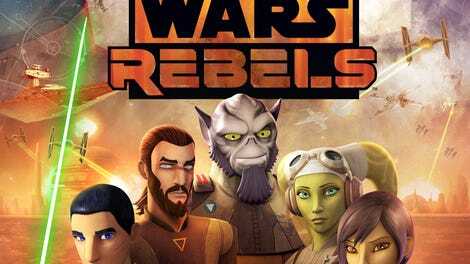 If there’s any big cameos or huge events that will be coming up in the next few weeks we’ll check in, but for right now that’s the end of Star Wars Rebels reviews.